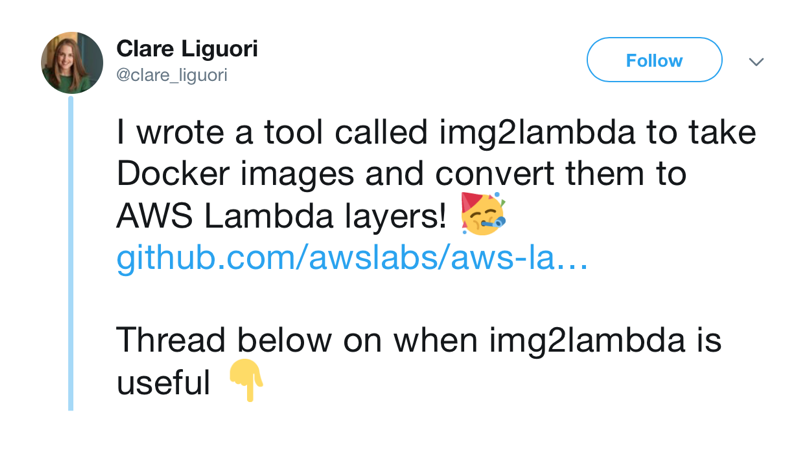 We investigate a handy new tool to help publish your local PHP runtime layers from Docker to AWS Lambda. I poked around with Clare's example and updated my lambda-php project in order to understand how it works. I also rewrote my runtime's bootstrap to make it clearer. The second part simply copies all the files in /runtime in the first container into a new container. This new container contains a single layer, which is our PHP runtime. Ideally, I would like to be able to update the layer with a new patch release of PHP and use the ARN so that all my functions don't need to be re-deployed. Maybe I'll look at how that can be done at some point. Have a play with my lambda-php project to see if this approach works for you. Also, check out Bref for another way to run PHP on Lambda.